Yummy and easy dip for cookies, fruit and more. Photo courtesy QVC. OMG, we haven’t even finished Thanksgiving leftovers but the countdown to Christmas is ON! If you’re too busy racing around and don’t have much time to prepare something special for family, friends or colleagues, here’s an easy treat from QVC’s chef David Venable. 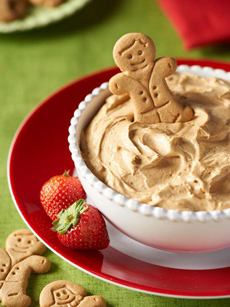 It’s Gingerbread Dip or Spread—yummy with cookies, cinnamon-flavored snack chips and sure, crudités. 1. PLACE the cream cheese, confectioners’ sugar, molasses, nutmeg, ginger, cloves and cinnamon in the bowl of a food processor. Process until the mixture is smooth. 2. SCRAPE the mixture into a medium-size bowl and fold in the whipped topping. Transfer to a serving dish.